Publisher(s) Neko Entertainment|<small><sup>DE</sup></small> BigBen Interactive<br />#NOMATCH#)/rs" is invalid. 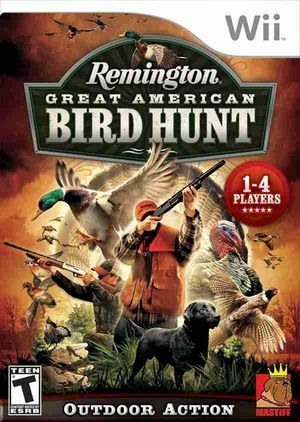 With arcade-style scoring, an arsenal of authentic Remington shotguns, and more than 50 trophies and power-ups to earn, Remington Great American Bird Hunt is a fast-paced and fun take on the sport of bird hunting. Remington Great American Bird Hunt challenges players to hunt through 60 levels of birds including turkeys, ducks, grouse and pheasants. Each type of bird calls for unique strategies and weapons. Players will find themselves well-equipped with Remington shotguns that look, feel and shoot like the real things. With a little help from Rockford, their trusty retriever, players will be ready to take on whatever flies their way. The graph below charts the compatibility with Remington Great American Bird Hunt since Dolphin's 2.0 release, listing revisions only where a compatibility change occurred.